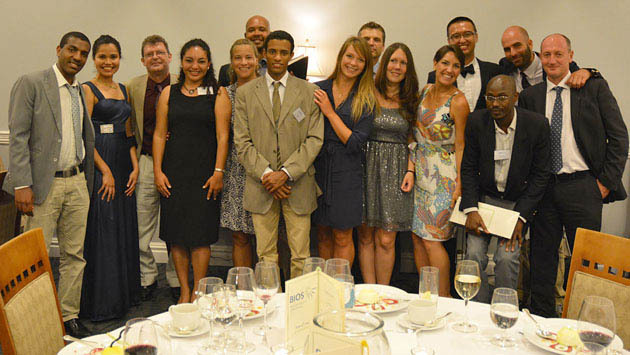 On Thursday, June 13, 2013 the BIOS community celebrated the achievements of the 2012/2013 class of the Center of Excellence in Observational Oceanography (CofE) with a graduation ceremony at the Fairmont Hamilton Princess. The nine students, hailing from countries around the world, completed a rigorous eight-month training program at BIOS that included education modules on topics crucial to developing aptitude in oceanography, including data management, scientific writing, and carbon geochemistry. The CofE program at BIOS aims to expand worldwide capacity to observe the oceans by training young scientists and strengthening ocean networking between developed and developing countries. Seen as the beginning of a long-term, sustained effort to build capacity in observational oceanography, the CofE program requires that students demonstrate how the training will impact their current or planned career path once they return to their home countries. His Excellency the Governor Mr. George Fergusson, Honorary Chancellor of BIOS, was on hand to provide the opening remarks at this year’s graduation ceremony. Afterward, Dr. John Farrington, BIOS Trustee and Dean Emeritus at Woods Hole Oceanographic Institution (WHOI), gave the commencement address. During his speech, Dr. Farrington connected the themes of lifelong love of learning and observational science, imploring students to keep an open mind when interpreting data and encouraging them to listen to the people who live and work on the ocean. Currently, the CofE scholars are pursing a variety of education and employment opportunities, both in their respective countries and abroad. Among them, Assefa Derbew has applied for graduate studies in the US, Europe, and Australia and is currently working as a lecturer in Meteorology and Hydrology at Arbaminch University in Ethiopia. Dr. Maria Leal-Acosta accepted a postdoctoral position at Universidad Nacional Autonoma de Mexico (UNAM) where she will be evaluating geothermal products in the Baja Peninsula and studying the influence of potentially toxic elements on the coastal environment. Taking Dr. Farrington’s words to heart, she is also continuing to work with her BIOS mentor, Dr. Maureen Conte, to publish a paper on the elemental composition of the Sargasso Sea.